Admin note: This blog is now running the new Scripty Goddess Comment Queue Script/MT Hack. All comments made on this site will now be pre-approved by moi before being made public. My blog. My rules. Quite frankly, I'm sick of the trolls... So don't panic if your comment doesn't show up immediately. I'll get them all added in just as soon as I can! Just file this one under "it's about damn time". Allows you to manually ping (send a TrackBack) to any weblog or service that accepts TrackBacks. Simply tell it the TrackBack URL you want to ping and fill in your URL, the entry name, and an excerpt. Read more about Simpletracks at Kalsey Consulting Group. UPDATE: Here's another similar option to file for future reference courtesy of another Kevin -- StandAlone TrackBack Form. Here's a wonderful new MT hack from the Scripty Goddesses -- comment pending queue. If you've been plagued by comment-trolls, or just want more control over your comments, this script allows your comments to be pending rather than instantly published. You can login, view, edit, delete and approve comments before they're made public. Go here for more information. Attention! There's no need to e-mail me and tell me the site is broken. (I've fielded several such e-mails today so this message is not directed at anyone in particular.) I deleted several of my skins yesterday in a fit of late-spring cleaning. If you're getting "warning" messages at the top of the page, follow the link to skin the site at the top of the page. Select a new skin. Proceed to the main page. And voilà. All should be fixed! What's happening is that your browser cookie is trying to pull a file that no longer exists, so you have to pick a new one first. From an earlier reminder of mine: Go to your "import/export" tab in the left menu and do an export of your blog. The directions are at the very bottom of the page. This will help you save a file of your blog entries, and all of its comments, through the time of export. If you have to install a new copy of MT from scratch after a database crash, you can run the export file you've just made through the import feature, and regain all of your past contents and comments (up to the date saved in export) immediately. There's also an easy way to back up all of your templates for safe-keeping from "the girlie matters". Better to be safe than sorry! A Wiki is a set of pages that let visitors share their knowledge in a collaborative format. This Wiki is dedicated to helping users of MovableType, a content management system. Best of wishes to the new Virtual Venus gang! UPDATE: Also from Kristine, word of two new desktop clients made specifically with MT in mind. Kristine recommends Zempt, and in her comments Doc suggests SharpMT. I now officially have more server space than God, and no caps on bandwidth. And there was much rejoicing. In case I haven't mentioned lately what an awesome site and blog host that Hosting Matters is, please be informed. By popular demand...you can now add a newsfeed to my site with comments. The link to it is in my sidebar (default Mae skin). For more information, visit Christine's and Jennifer's. A new MT hack passed along by goddess Kristine.....prevent commenters from multi-submitting the same exact comment by hitting your post-button repeatedly while waiting for the comment to publish. 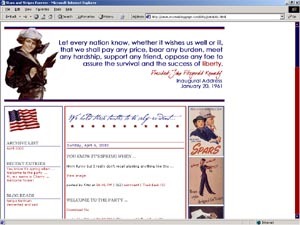 Statia has a bitchin' new patriotic design, which reminded me of an old template I used to have on my blog after 9/11. She suggested I recycle it and put it up as shareware -- so after a few tweaks, it's now ready to go. You can see it in action over at Kitty's blog on a temp page. Please note that it was designed to work with Movable Type (it's ready to go as your index.html file) -- but it can be modified for other blog software at your own discretion. If you decide you want it and just can't live without it, right-click here to download the zip file with the images, HTML, and instructions. Leave me a ping or a note if you use it so I can go see! Thanks! UPDATE (9:25 PM EDT): I changed one line of code for the comment pop-ups in MT on "template_code.txt". If you've previously downloaded the above .zip file this evening (since updated), you can get the updated version of "template_code.txt" here. This weekend I had a couple of people ask me how they pinged my site when they didn't link to any of my individual entries. If you're running MT with auto-TrackBack enabled, I have a hack running to send me a ping any time tampatantrum.com itself is linked. You can find out more about this at Scripty Goddess. Have HTML source code you really don't want the rest of the world to see? This isn't 100% fool-proof, but it's one of the best (and free) methods I've found out there. Just type your code into the second box (under the example) -- hit the "encrypt HTML Source code" button below it -- and voilà! A bunch of gobbelty-gook you can copy, paste and upload that most people won't be able to decipher when snooping through your page-source. Just don't forget to save your original! For more information visit the "Source Code Protection Generator". Time for another image grab bag -- if you want a patriotic design, snag one! Just seen over at Michele's....."how to use Movable Type's trackback to show what's playing on your WinAmp playlist". Yet another toy to add to my million-mile long to-do list! UPDATE: Actually this one went rather quickly. It's already added to the default Mae skin and its scaled-down version (1024x768+ or 800x600). And there was much rejoicing... I have just successfully transferred the one domain I had left with Network Solutions (back when I was stupid enough to pay them for two years in advance) to another registrar. Hurrah! w.bloggar is a free application from Marcelo Cabral that tries to make writing blog posts as easy (or as hard) as using Microsoft Word. The application sits between you and your blog publishing software. It provides a Word-like interface with all the little toolbar buttons for formating text and even has a spell-checker. w.bloggar is compatible with Blogger, b2, Nucleus, BigBlogTool, Blogworks XML, Blogalia, Drupal, and, of course, Movable Type. So if you hate the Blogger interface...or just want to be a lazy American with any of the other software...there you go. UPDATE: Bushtit Dot Com has a great w.bloggar review! No extraneous comments. No questions. No compliments. Don't worry. The above tips and tricks will not be on the final exam. Just a quick heads-up -- Textpattern Beta 1 is now available for download. (This software was created by the same person who brought us the supah fly Textism referrer script.) This software is a content management system alternative to Movable Type (version 2.62. just released! ), Greymatter, pMachine, etc. Check it out if you are so inclined. Well it looks like it's that time of year again -- the Valentine's skins are starting to roll out. I don't have time to make one here right now, but I do have four pinup images up for grabs from my stash if you want to use one -or more- at your own sites! Be careful opening those first two at work, mmmk?